At its most basic, a “good” faucet is one that does its job well. That is, lets water out when you turn it on, and doesn’t let water out when it’s turned off. Okay, so that’s not all we’re looking for when we look for a “good” faucet. If it was, we could install a hose bibb in the kitchen and call it good, right? So, let’s try again: What makes a good quality faucet? You know, something we’d be proud for others to see in the kitchen or bath and will enjoy for years? Ah, that’s a little more tricky, but we’ll figure it out together. A good, quality faucet, has almost nothing to do with the style of the faucet, the finish of the faucet, or its location. Kitchen faucets are not inherently “better” than laundry faucets, and single hole faucets are not automatically “better” than centerset faucets. A high quality faucet functions well over the years, has repair parts readily available when maintenance is required as well as other support from the manufacturer. Let’s take a minute and go into these a little more. Consider what the faucet is made of. In most cases, quality faucets are made from brass or stainless steel, but the material composition does not guarantee the quality. If possible, look at the faucet construction in person. Are the threads cut neatly, or do they seem a little off? Does the swivel spout move easily? These things can give you a feel for the quality and workmanship. Examine the finish. Does it have flaws? Is it consistent? Is it a PVD finish or a living finish? These are things that can help tell you what to expect from the finish in the years to come. Try looking for replacement parts for any faucet you consider. If you cannot find them, you may have problems down the road when you try to repair your faucet. Will you need to ship the faucet to the manufacturer for a cartridge change, or can you do it at home? If your faucet is an investment you plan to keep for the next decade or three, you will eventually need to repair it. If you plan to change out your faucet in the next few years, it may not be as much of an issue. Check out the manufacturer of the faucet. A well-known manufacturer may or may not make a “better” faucet, but they might have better support, which typically means less frustration if a problem does occur with the faucet. Talk to your local plumbing house, installers, and anyone you know with that brand and/or style of faucet to get their impressions and learn from their experiences. If a faucet has a great looking lifetime warranty, but the manufacturer or retailer is unresponsive, the warranty may not be worth as much to you. On the other hand, a warranty that only lasts a few years, but with a manufacturer that has a great history of taking care of their customers may be more useful, even after the warranty has expired. Naturally, no matter how “good” the faucet is, if you don’t like the way it looks, you still won’t be happy. Keep in mind that many manufacturers make visually similar styles, so you have choices there, as well. Whatever faucet you choose, we always recommend keeping the manual, parts breakdown, and any other paperwork safe for future reference, just in case. 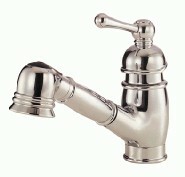 Your turn: what’s the best or worst faucet you’ve encountered and why? This entry was posted in DIY, Do it yourself, Faucets, home improvement, Home Repairs, Plumbing and tagged choosing a faucet, DIY, do-it-yourself, faucet, hints and tips, home repairs, how to, plumbing, plumbing supplies, water on April 20, 2012 by PlumbingSupply.com. All faucets aren’t created equal. You bring up a good point in suggesting to look for replacement parts. If they are hard to find you might want to consider a different option. Thanks! Finding replacement parts is probably the top complaint from customers about their old faucets. The other top complaint is matching other fixtures’ finishes, of course! Plumbing supplies come under the basic home services and that’s why this must be cheap and affordable. I have found nice content about the plumbing supplies where quality is the most important factor. Thanks for giving us an overview to the things we need to consider and the parts that we need to have an outdoor kitchen. The market today is teeming with various kinds of shower faucets, from brass, antiques, stained nickel, polished chrome and gold to copper, steel and other combinations. Although individual preference is a factor in choosing a shower faucet, the price and the quality are the most important considerations among others. How will you buy a faucet if you cannot afford it? And if the faucet you chose is affordable, is it long enough to sustain daily use? Nice summary with great points to consider. No matter how pretty the faucet is, you still have to get it home and then live with it!